It’s been quite a week…..
On Monday we learned my Unlimited international commission And Suddenly I Disappear: The Singapore/UK ‘d’ Monologues has been nominated for Best Ensemble at The Singapore Theatre Awards. This is wonderful news, particularly from a disability perspective and regarding inclusivity. Many of my collaborators from Singapore (such as the fabulous Steph, below) were emerging performers, appearing in this first ever all Deaf and disabled-led project in Singapore, directed by Phillip Zarrilli and produced by Access Path Productions. For the quality of the work to be recognised so quickly and so publicly, is a real triumph, regardless of the actual final ‘results’. Those of us who are ‘veterans’ of the UK’s disability art scene (including Sara Beer – also performing in the ensemble) have been hammering on the doors to be given access and opportunity for DECADES. Things are changing in the UK, as across the world, but it is gratifying that this international collaboration – the first of its kind in Singapore – is included in the nominees for this award. The salty old crip’ cynic in me would say award nominees are usually non-disabled actors ‘cripping up’ to play a disabled character. It’s satisfying that for once Deaf and disabled actors are being nominated for playing a variety of ensemble characters (and not a Tiny Tim in sight). Stephanie Fam performing in Kaite O’Reilly’s international Unlimited commission ‘And Suddenly I Disappear… the Singapore ‘d’ Monologues. Sophie Stone in background. The week proceeded with a terrific review of my forthcoming publication – Persians – with Fair Acre Press. National Theatre Wales originally commissioned this new version of Aeschylus’s masterpiece – the oldest extant verse drama in the Western theatrical canon – for Mike Pearson’s site-specific performance on MOD land. The verse drama will be released later in the Summer, and I can’t wait to reveal the glorious cover, featuring several of the performers from the original production, in a special blog later this month. Meanwhile for the curious, a thumbnail of the cover is included in Liz Jones’s New Welsh Review critique of the text, reworked as poetry for publication, here. I returned back to Wales in the early hours of this morning, reading further positive comments about Taking Flight Theatre Company’s production of my play peeling, which is currently touring. It’s in Manchester tonight, and other dates in Wales and Oxford over the next few weeks, finishing this leg of the tour on May 4th in Cardiff. Both The Stage and The Guardian gave the production (directed by Elise Davison) sparkling four stars reviews. Details of the tour can be found here. Finally, this morning I woke to a review of my collected monologues The ‘d’ Monologues in Wales Arts Review. Reviewer Tomos Morris and I met last month over a cup of green tea for an interview for The Cardiff Review, out later this month. I’m delighted Tom’s extensive research has been put to good use in his critique, which you can read here. Meanwhile, the fire is burning, the bottle of wine uncorked and a few hours of relaxation beckons…. In 2014/15 I had the great pleasure of collaborating with Gaitkrash, Theatre P’Yut, the Llanarth Group and independent artists Jing Okorn Kuo and Adrian Curtin on playing ‘The Maids’, a response to Genet’s Modernist play. Our process was fully documented on this blog, and my co-creators have been reflecting on our process since, publishing articles in various journals and on-line platforms. The following is the opening to a fascinating essay by cellist and co-creator Adrian Curtin, with a link to the full text, below. With thanks to Adrian and Contemporary Theatre Review/Taylor and Francis Online. I wanted to make the piece because I loved the Vivaldi. So it was my way of having a conversation with Vivaldi. I decided to rewrite the score on a note level, which meant re-recording it with an orchestra. [That] let me […] get inside it and […] start to work with the alchemy of the material itself, and […] gave me much more scope in terms of what I could do with it. I […] went through [Vivaldi’s score], picking my favourite bits and kind of ‘turning those up’ and making new objects out of those. It was […] like a sculptor having fantastic raw material and just putting it together in a way which kind of pleased me. he Four Seasons, which has become depressingly familiar through tinny reproductions heard on the telephone, in shopping malls, and on elevators and airplanes, gets a new lease of life courtesy of Richter’s recomposition. Richter abstracts elements from Vivaldi’s concertos (about 25 per cent, in his estimation) and gives them a new spin, looping and collaging fragments, creating new textures, recasting the patterns of baroque music as electronica-inflected post-minimalism. Richter’s version provides an uncanny listening experience. It sounds both familiar and unfamiliar; the composer deliberately subverts expectations in places. The effect is disconcerting, but intriguing – rather like overhearing a delightfully skewed mental rendition of Vivaldi’s iconic work. Musical recomposition is not new. As Joseph N. Straus observes: ‘[t]he desire to recompose the works of one’s predecessors seems to be almost as old as Western music itself’. Straus argues that twentieth-century composers such as Schoenberg, Stravinsky, and Webern were prompted to recompose the work of earlier composers as a result of ‘anxiety of influence’ (Harold Bloom’s famous phrase). ‘In their recompositions’, Straus writes, ‘[these twentieth-century composers] reinterpreted the past in order to avoid being crushed by it. They attempted to neutralize significant or characteristic works of the past by imposing upon them a new, distinctively twentieth-century musical structure’. Richter’s statements about his recomposition of The Four Seasons suggest that he was motivated, not by a struggle for artistic autonomy, but by a desire to enter into dialogue with Vivaldi and create something that would complement this canonical work and allow it to be heard differently. It is commonplace for playwrights and theatre-makers to adapt existing dramatic material and present it in an altered, updated form. This can involve deliberate subversion of the source material. For instance, Richter’s recomposition of Vivaldi’s score is suggestive of contemporary ‘Regie’ approaches to theatre and opera, as undertaken in continental Europe. Regie ‘plays’ with the text in an often overt, directorially provocative manner. It can lead to the ‘recomposition’ of a text for performance. To my knowledge, the term ‘recomposing’ has not been used to refer to the creation of new theatre that directly draws on an acknowledged ‘primary’ source (i.e. an existing play). Yet, it is an apt term to use, I suggest, when discussing work that borrows from the dramatic canon but eschews the conventions of dramatic theatre in favour of alternative ‘compositional’ methods. Matthias Rebstock and David Roesner have proposed the term ‘composed theatre’ for work that, in Roesner’s words, ‘[brings] the musical notion of composing to the theatrical aspects of performing and staging’. This aligns with ‘recent developments towards postdramatic forms that de-emphasise text, narrative, and fictional characters, seeking alternative dramaturgies (visual, spatial, temporal, musical), and focusing on the sonic and visual materialities of the stage and the performativity of their material components’. Composed theatre does not simply refer to the use of music in theatre; rather, it is a way of conceptualising theatre made using compositional strategies and techniques that are ‘typical of musical composition’. Recomposed theatre, I propose, may denote theatre that explicitly reworks pre-existing source material from theatre history in a musically compositional manner. The term provides a new way of thinking about adaptation. An example of recomposed theatre is playing ‘the maids’, a co-created piece made by an international ensemble of seven artists working with Kaite O’Reilly (dramaturg) and Phillip Zarrilli (director) that premiered at Chapter Arts Centre in Cardiff in February 2015. playing ‘the maids’ previewed at the Granary Theatre in Cork, Ireland as part of the Cork Midsummer Festival on 20–21 June 2014. It was performed at Chapter Arts Centre in Cardiff on 19–21 and 27–28 February 2015, in Theatr Brycheiniog, Brecon on 26 February 2015, and at Aberystwyth Arts Centre on 6 March 2015. A 14-minute promotional video is available here. Three theatre companies collaborated on this project: The Llanarth Group (Wales), Gaitkrash Theatre Company (Republic of Ireland), and Theatre P’yut (South Korea). Jing Hong Okorn-Kuo (from Singapore) and I (also from Ireland) worked with these companies as independent artists (Okorn-Kuo as an actor/devisor, I as a cellist/devisor). As the title suggests, playing ‘the maids’ relates to Jean Genet’s classic drama Les Bonnes (The Maids, 1947). However, it was not a production of that play. This was stated in the programme. There have, of course, been many experimental stagings of Genet’s texts. For an account of key productions of The Maids, see David Bradby and Clare Finburgh, Jean Genet (Abingdon: Routledge, 2012). Rather, it used Genet’s text as creative inspiration, focusing on its character relationships and power dynamics as part of an oblique investigation of modern servitude, wealth-as-privilege, cultural notions of guilt and oppression, phantasms, and the politics of intimacy. It took themes from Genet’s play and recomposed them via a montage of newly written, found, and adapted text (primarily English-language, with some Mandarin, Korean, and Irish), psychophysical scores, choreography, and sound compositions that Mick O’Shea (a sound artist) and I performed onstage. The production featured two sets of maids, one Irish (performed by Bernadette Cronin and Regina Crowley) and one Korean (performed by Sunhee Kim and Jeungsook Yoo). Okorn-Kuo played a Chinese ‘madame. I will refer to Okorn-Kuo’s character as ‘madame’ rather than ‘Madame’ to differentiate her from Genet’s creation. The idea of using lower-case spelling for this purpose is Zarrilli’s. Similar to Richter’s recomposed Four Seasons, playing ‘the maids’ appropriated a canonical work for the artists’ own purposes, mining the source-text for raw material, re-contextualising it, and playing it anew. In this article I will outline how playing ‘the maids’ functioned as a stage composition, and more precisely as recomposed theatre, by analysing its musicality. I will consider the sonic/musical components of playing ‘the maids’ as well as musically inflected aspects such as its dramaturgy and performance style. In this, I follow Roesner’s lead in treating musicality as a ‘perceptive quality that goes beyond the aural sphere’ to attend to ‘musical qualities or relationships of non-auditory events, such as silent movement, gesture, or even colour schemes’. David Roesner, Musicality in Theatre: Music as Model, Method and Metaphor in Theatre-Making(Farnham: Ashgate, 2014), p. 14. Analysing playing ‘the maids’ using this theoretical lens illuminates various aspects of contemporary theatre-making and demonstrates the significance of their inter-operation here. These aspects include the creative re-use of canonical source material, international collaboration, intercultural dramaturgy, musicality as process and paradigm, the continuing relevance of Genet’s work, and the vibrant legacy of theatrical modernism. My analysis of playing ‘the maids’as an example of ‘recomposed theatre’ is not meant to foreclose other ways of conceiving it. I primarily situate the piece in relation to western concepts and cultural traditions because of my background and knowledge specialism. I recognise that the piece might be interpreted outside the context of modernism, for instance. My collaborators Jeungsook Yoo and Sunhee Kim have co-authored their own scholarly account of this piece. See Jeungsook Yoo and Sunhee Kim, ‘The Actor’s Process of Negotiating Difference and Particularity in Intercultural Theatre Practice’, Theatre, Dance and Performance Training, 7.3 (2016), 417–37. I develop these motifs in the following ‘tracks’. The rest of Adrian Curtin’s essay can be accessed here. playing ‘The Maids’ video – Wales, Ireland, South Korea, Singapore, Austria…. 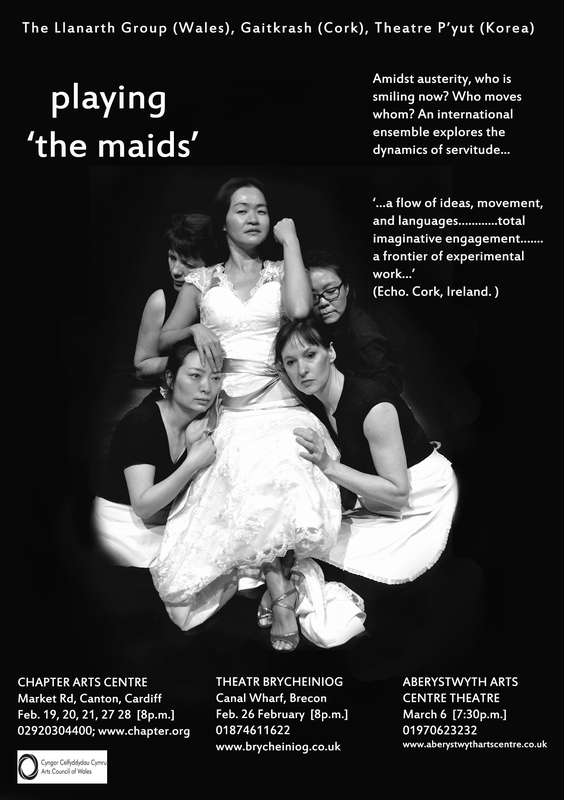 Earlier this year I was dramaturg and co-creator of an intensely exciting intercultural production between The Llanarth Group (Wales), Theatre P’Yut (Korea) and Gaitkrash (Ireland): playing ‘The Maids’. Documented elsewhere on this blog, we responded to issues in Genet’s ‘The Maids’ in the contemporary global context of austerity and boom. Paul Whittaker of Hide Productions documented several performances, and I’m really thrilled to be able to post the link for a stunning film he has made of the work. 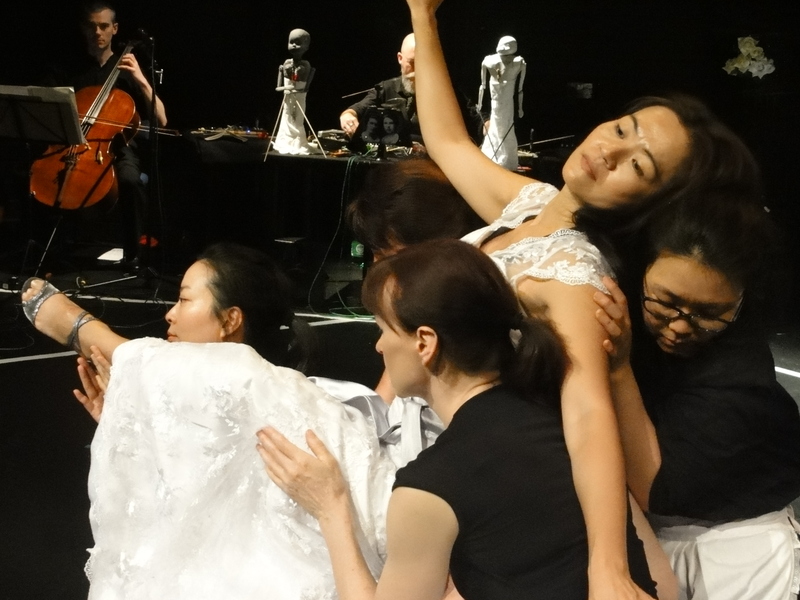 In the week that the excellent Wales Arts Review relaunches with an improved website and more in-depth analysis, I’m delighted to see my last production, ‘playing The Maids’, an intercultural, international collaboration with Theatre P’yut (Korea). Gaitkrash (Ireland) and The Llanarth Group (Wales) is prominently featured. At a time when theatre reviewers of national newspapers are no longer supported to go outside the capital to see work, initiatives like Wales Arts Review become even more the life blood of cultural engagement and analysis. What is particularly gratifying is the joy with which the talented writers of Wales Arts Review undertake this serious task. It is a pleasure and relief to have the journal back and I highly recommend it, whether you are based in Wales or not. You can find cultural commentary, arts coverage, reviews, commissioned new fiction and a whole lot more at http://www.walesartsreview.org Subscribe. Remarkably, it’s free, and feels like a gift dropping into your email in-box. When theatre occasionally wriggles free from the straight-jacket of linear narrative there is, perhaps, no more effective art-form for interrogating the contingencies and potentialities that surround a single moment of space-time. In such a moment, charged with the twin forces of past and future, it is possible to feel the weight of history upon the present while, simultaneously, being able to intuit the profound consequences of events that are still in flux. The considerable achievement of playing ‘the maids’ – a dazzling intercultural collaboration from the Llanarth Group (Wales), Gaitkrash (Ireland) and Theatre P’yut (Korea) – is that our contemporary moment of global economic crisis is explored, with great clarity, purpose and theatrical power, from the multi-perspectival viewpoint of nine creative collaborators from four countries, working in four different languages and from a variety of theatrical and musical traditions. The intellectual rigour of the piece is impressive, in particular its meta-theatrical treatment of Jean Genet’s modernist masterpiece The Maids, but crucially at the heart of the piece is the stark reality that the product of economic and gender inequality is only human suffering, rage and despair. The choice of The Maids as source material for a piece about inequality seemed particularly apposite for the creative team, as cellist Adrian Curtin – who provided the musical accompaniment and vocalised stage directions in performance – explains: ‘In Genet’s play, servitude is toxic and corrosive; it ensnares all involved and is perpetually dynamic.’ The mutual entanglement of mistress and servant in a dynamic of power infuses Genet’s work with a disturbing atmosphere of menace, eroticism and exploitation, which remain relevant to modern audiences. Curtin adds, ‘Where is power located? What guises does it take? What are its effects? Genet’s text provided an excellent framework with which to explore these questions’. However, the globalisation of the world economy in the past thirty years, and in particular the ‘rise’ of the Asian economies; coupled with decades of feminist and post-feminist thought, have complicated the question of economic and gender inequality beyond the rigidly class-based politics of Genet’s play. Director Phillip Zarrilli says: ‘[W]hen we initiated our collaborative process, we agreed to use Genet’s play as a ‘foil’ – a beginning point for responding in new ways to the powerful issues that underlie the play’. The result is a performance piece – it resists simple definition as a play – that responds to the complexities and nuances of modern globalised capitalism and the legacies of imperialism. This collective decision to use The Maids as an inspirational source, rather than as a primary text that the production might serve, was not only important in terms of liberating the nine creative collaborators to explore beyond Genet’s analysis of power, it also meant that a fully intercultural collaboration between them was made possible. The aspirations of multiculturalism are laudable and desirable with regard to militating racial discrimination and encouraging religious tolerance, but in practice it too often works to eradicate genuine cultural differences in pursuit of its aims of social integration or assimilation. Interculturalism is concerned with dialogue and exchange, it recognises and insists on difference but does not recognise the dominance of one culture over another. In Cultivating Humanity Martha Nussbaum observes that interculturalism recognises ‘common human needs across cultures and of dissonance and critical dialogue within cultures’. With the intention of creating a performance piece that would question, criticise and satirise the power interests of global capital, neo-imperialism and the super-rich oligarchs of East-Asian economies, the imperative of finding some ground on which an intercultural dramaturgical dialogue could take place was clear to all involved in playing ‘the maids’. Genet’s play was therefore situated as a meeting point at which each creative collaborator could engage as theatre artists, all incorporating their own cultural-specific responses to the source play within the process of play-making. Writing in Exeunt, Irish-born Wales-based playwright, Kaite O’Reilly, describes how intercultural dramaturgy makes particular demands of its collaborative creative partners, in that the customary defined roles of ‘director’, ‘writer’ and ‘performer’ become somewhat opaque, as each member of the company is required to introduce material of some kind toward the development of the piece. Allowing typically prescribed creative roles to become ‘porous and overlapping’ can liberate and empower individual performers to coalesce as a richly-textured ensemble, equally, it can also threaten unnecessary confusion and chaos in the rehearsal room. It is therefore essential that working relationships of deep mutual trust be established when creating work in the open and inclusive manner described above. Happily, playing ‘the maids’ benefitted from what O’Reilly describes as ‘the firm foundation created by previous collaborations between the various artists involved.’ Crucially, Zarrilli has worked for a number of years with all five actors involved in the project, who have each received training in the director’s psychophysical training. The fruits of Zarrilli’s methodology are clear to see (and hear) in playing ‘the maids’ – it has been a long time since this critic has observed a cast that is so evidently and intensely listening to each other. They make the act of listening palpable, and imbue the performance space with a concentrated energy that is utterly riveting, especially during moments of silence and stillness. Given the nature of intercultural exchange, it is of critical importance that each onstage performer fully commits to each act of speech and of listening, so that surprising and provocative relationships between different cultural traditions might emerge and engage meaningfully with each other. A good example of such a relationship developing in performance comes as Jeungsook Yoo performs a dance called Salpuri. The dance derives from Korean Shamanistic tradition and it is purportedly meant to release Han, which roughly translates to English as an expression of deep collective or personal suffering. The dance is accompanied by Irish actor Regina Crowley, who sings a song of lament, in Gaelic, which references that painful time in Irish history when its indigenous language and culture was banned by the occupying British Empire. Of course, Salpuri and Irish folk songs are highly individual products of separate historical processes that are unique to Korean and Irish culture, and are therefore not necessarily expressions of the same thing. Yet when they are juxtaposed next to each other in performance certain resonances are made available to an audience, as respective national memories of imperial oppression, famine and war are communicated to offer tantalising new meanings. Complex cultural inter-relationships find witty expression during what is perhaps the most entertaining passage of playing ‘the maids’, when Jing Hong Okorn-Kuo, playing Madame, sings a pop song in mandarin. The Singaporean actor performs this high-camp number with gestures that quote from the performative traditions of Beijing Opera and Chinese soap operas. At the same time, the two Korean actors dance Gangnam style while their Irish counterparts do a jig. In counterpoint to the Chinese music Adrian Curtin starts to riff on the theme tune of popular sitcom Father Ted on the cello. Each of the performers appears to delight in sending-up the clichés and stereotypes of their own cultures. The effect is to balance the more challenging explorations of dominance and exploitation explored elsewhere in the production. The nine collaborators who devised playing ‘the maids’ create a richly textured and multi-layered examination of global capitalism at a pivotal moment in history. They do so by realising a multi-perspectival vision that is of particular interest because it reflects the experiences of so called smaller nations, from which they each originate. It is exciting to find that Wales, as the host of this stimulating collaboration, is making a timely contribution to the global discourse on money and power. It is also worth noting that playing ‘the maids’ examines gender inequality as poignantly as it does economic inequality. This quality is enhanced by the presence of five female actors in the cast, who bring their respective histories as women to the piece. As Jeungsook Yoo explains, there exists a ‘Korean obsession with ideal beauty’ that has fuelled a ‘boom of the plastic surgery and cosmetics industry’ in the country, which ‘resonated with the maids’ aspiration towards Madame’s beauty and wealth’. Both Korean actors satirise this yearning fascination with a highly-westernised concept of femininity in one short devastating scene that epitomises the tyranny of glamour. Whereas, near the end of the play, Jing Hong Okorn-Kuo as Madame, immaculately dressed and poised, embodies the glamour of tyranny as she pronounces: ‘While in Hong Kong, or Singapore being served canapés and champagne by white-gloved waiters in white and gold uniforms, have you ever selected your next London apartment just for the view along the Thames?’ It is in moments like these, contrasting the vast wealth that is accumulating within narrow sections of the Asian economies with the new paradigm of austerity that is plaguing the West, that you can sense just how the tectonic plates of the world economy have discernibly (and possibly irrevocably) shifted. Another source material for playing ‘the maids’ is Piketty’s Capital in the Twenty-first Century. The book’s central thesis is that wealth is increasing becoming concentrated in the hands of tiny moneyed elites as the rate of return on capital exceeds the rate of economic global trends in economic growth. The resulting unequal distribution of wealth causes social and economic instability, what Piketty calls the ‘endless inegailitarian cycle’. Piketty’s phrase inspires the final image of playing ‘the maids’ that sees the entire cast running round in circles, holding aloft a puppet effigy of Madame, which represents their hopeless lack of agency in a world in which finance has become a self-feeding malignant force that devours the future. They spiral into complete darkness – the clatter of their shoes beating an insistent rhythm. The image disturbs and saddens, as it should, but the creative ambition and intercultural reach of this extraordinary company provides sufficient inspiration to offer some consoling light. (c) Phil Morris. Wales Arts Review.